General Motors will use the 2013 Indy 500 to showcase the new Chevrolet Camaro Hot Wheels Edition Convertible – a droptop version of the gorgeous life sized toy that debuted at the 2012 SEMA Show in coupe form. Dating back to the 1960s, General Motors has provided specially equipped Chevrolet Camaro “festival cars” for officials of the Indy 500 to drive around the Central Indiana area to publicize the race and for the 2013 Indy 500, that festival car is the new Chevrolet Camaro Hot Wheels Edition Convertible. These cars will be driven regularly around town by the 33 Indy 500 directors of the race but where in past years, these cars were intended more to draw attention to the big race – the 2013 Camaro Hot Wheels Edition Convertible Indy 500 cars also help bring local attention to the upcoming limited edition Hot Wheels package for the Camaro coupe and convertible. GM introduced the production version of the Hot Wheels Camaro at the 2012 SEMA Show in coupe form and while the Hot Wheels Convertible is nearly identical shy of the canvas roofline, it is still one great looking special edition. The Festival cars are finished in the gorgeous metallic blue paint with a black canvas top and a matching black stripe on the hood. A set of unique wheels with black painted spokes and machined faces with a familiar Hot Wheels “redline” treatment work with the unique front splitter, the unique badging and the Hot Wheels branded interior to complete this package. GM boasts that this is the first time that an automaker has built a full sized production version of a Hot Wheels toy and having been at the debut of the Hot Wheels Camaro – I can attest that this is one great looking option package. 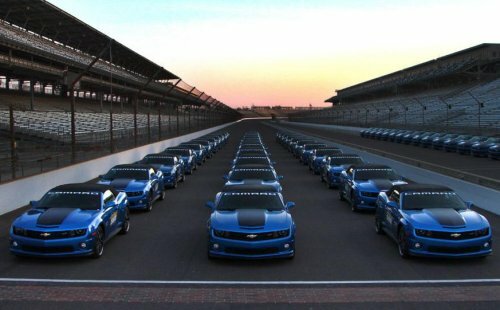 It will be interesting to see if Chevrolet dealerships offer an Indy 500 package for the Camaro as they have in past years. The Indy 500 Edition Camaros have become collectables for as long as the big race has been working with GM but we wonder if the automaker will combine two special edition packages – as the Hot Wheels Camaro Convertible is already a special package and the Indy 500 Official Vehicle package would need to be added on top of the Hot Wheels edition. In either case, we can expect to see some of these 33 hit the auction block over the next year – especially if dealerships don’t offer an Indy 500 Edition Hot Wheels Edition Camaro Convertible. Collectors love cars that are more optioned up because there are less of them and that equals a higher future collectable value so if some Indy 500/Hot Wheels Camaro Convertibles do hit the dealership build sheet, these could be among the most collectable of the current 5th generation Camaro shy of the super Camaros like the ZL1 and the new Z/28. The 2013 Chevrolet Camaro Hot Wheels Edition is available in either 2LT or 2SS trim which means that buyers will be able to pick between the 323 horsepower LFX V6 (2LT), the 400 horsepower L99 V8 (2SS automatics) or the 426 horsepower LS3 V8 (2SS manual transmission). Buyers of the 2LT and 2SS coupe and convertible can pick between the 6-speed manual and 6-speed automatic transmission while those 2SS buyers who opt for the 6-speed manual transmission can also select the dual mode exhaust system that tacks on a few extra ponies. The 97th running of the Indianapolis 500 takes place on Sunday, May 26th 2013 but the Festival begins on May 11th with festivities running up to the day of the big race.